The Day After Everything Changed is Ellis' 15th Studio album and comprises the best songs of his career to date. 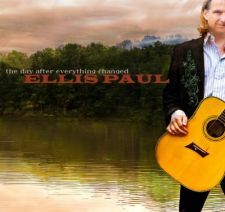 Review from Direct Current: After 15 years of recording one exceptional album after another, it would be appropriate to toast legendary New England singer/songwriter Ellis Paul's sheer longevity in a business that often overlooks the original voice and rewards mediocrity instead. But with the January 12 release of The Day After Everything Changed we're struck more by the fact that Paul is still playing at the top of his game to such an extraordinary degree. It is, as always, the quality not the quantity but in this case we're rewarded with both. For anyone unfamiliar with the output of one of the defining voices of American songwriting, this steller new album is a great place to start. Sumptuously produced, The Day After boast a full array of songs both personal and socially aware, from the gloriously soaring title track to the heartbreaking, Randy Newman-styled portrait of a post-Katrina New Orleans in "Hurricane Angel". If there's a more devastating indictment of the events surrounding that defining moment in history we've yet to hear it.